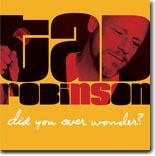 Blues/soul singer Tad Robinson delivers a knockout with his latest, Did You Ever Wonder?, for Severn Records. It's this month's Pick Hit. 89-year-old blues legend Robert Jr. Lockwood headed to Phoenix to record his latest album, a live set that is our Surprise pick. We Flashback this month to three classic soul re-issues on the Grapevine label, including a collection of songs by songwriter extraordinaire George Jackson. This month's What's New section features new releases from Jumpin' Juba, Omar & the Howlers, Jessie Mae Hemphill (both a new recording and a disc of previously-unissued sides), Juneteenth, Mel Brown, Marion James, and a trio of scintillating compilations from Blind Pig Records, plus a special section of DVD releases reviewed by veteran Blues Bytes contributor Mark E. Gallo.